The European storm petrel (Hydrobates pelagicus) is a small bird, little bigger than a sparrow. It appears all black with a white rump. It flies very close to the water surface, and often feeds in flocks behind trawlers. Petrels breed along the rocky west coast of Ireland in offshore islands from May to September. It winters at sea. It eats fish plankton and crustaceans. 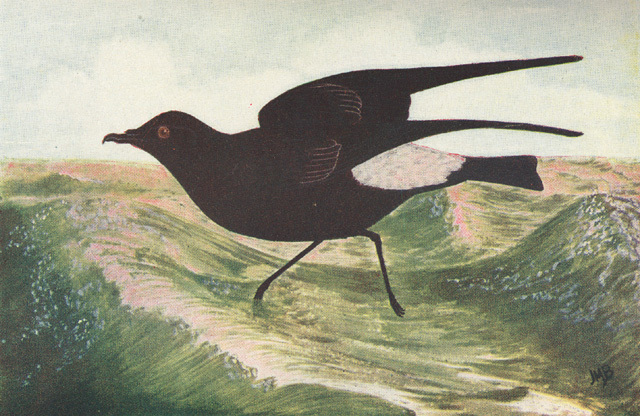 It is thought that 67- 75% of the worlds storm petrels breed in the UK and Ireland. They are nocturnal birds, never venturing too far from their nests to feed. This bird is protected under the EU Birds Directive, which means that its is of high conservation importance in EU terms. One of the largest storm petrel colonies in the world is on Inishtooskert comprising of approximately 27,155 nests. It is on the amber list of birds in need of conservation for Ireland. Ireland's wildlife does not stop at the sea's edge, and the world of the ocean wields great influence over the land. Our comparatively mild winters owe a great deal to the warming eddies of the North Atlantic Drift, or Gulf Stream, which carry water from the tropics to our Continental Shelf. In the climate change brought about by global warming, this benevolent ocean mechanism may be slowed or halted, bringing a dramatic fall in winter temperatures. Meanwhile, increasing evaporation from a warming ocean may be intensifying Ireland's rainfall and levels of humidity. To the south-west of Cork and Kerry, strong ocean currents lift cold water from the seabed, rich in dissolved mineral nutrients, an upwelling that nourishes the growth of plant plankton (phytoplankton) in the surface layers. This feeds tiny marine animals (zooplankton) that in turn feeds shoals of fish. The abundant food draws cetaceans and seabirds to the deep waters of Ireland's south-western approaches, so that gannets dive among feeding dolphins and shearwaters skim among whales. The Manx Sheerwater (Puffinus puffinus) has dark plumage on its back and head with a pale coloured underside. It has distinctive orange legs and webbed feet. On the wing it has a distinctive flight pattern, flying in a series of rapid flaps followed by long glides over the surface of the sea. An estimated 94% of the worlds Manx Sheerwater population breeds along the Irish and British coast. Like the Storm petrel, the Sheerwater is a nocturnal bird, staying close to the colony when feeding. The majority of Manx and Storm petrels have their colonies in Kerry, The Blaskets, Skelligs and Puffin Island. They feed on fish, in particular herrings, sardines and sprats. The waters off Cork and Kerry have the highest densities of sea-going birds anywhere in Ireland or Britain, and their breeding colonies on islands such as the Skelligs and the Blaskets are internationally known. The gannets of Little Skellig, which migrate from winter quarters off Africa, make up the second biggest colony in the Earth's northern hemisphere: some 27,000 birds turn the top of the island white in summer. 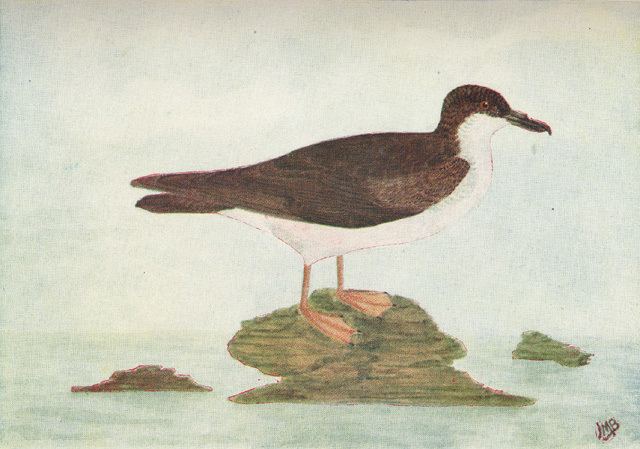 Other huge breeding colonies are those of two species of petrel (tube-nosed birds) which, as darkness falls, fly in to their nests in burrows and crevices among the sea-pinks and rock-screes of uninhabited islands. The storm petrels, smallest of all Atlantic seabirds, together with the much larger Manx shearwaters, are impossible to census with accuracy. But their nests, on islands from Kerry to Donegal, number perhaps scores of thousands and account for a large proportion of their species' breeding populations. In this picture the head and beak of a fin whale (Balaenoptera physalus) can be seen. The blow, a distinctive characteristic, can reach a height of 6m and can be seen for a great distance on windless days. The head of the fin whale is v-shaped and grey coloured. The beak is narrow and pointed. One of the diagnostic features for fin whales is the colouration of their baleen and lower lip. On the right hand side of the whale both are coloured white, as seen in the image, and on the left hand side (unseen) they are both dark coloured. Fin whales are the second largest animal species on the planet, with their average size being 19-20.5m in length, second only to the blue whale. Although Fins generally stay in deep waters they can move to within viewing range of our headlands when feeding opportunities arise. To date most sightings have been in the Cork and Waterford area. This may be due to increased observer effort by the Irish Whale and Dolphin Group in this area. Researchers in Cornell university suggest that 300-500 fin whales pass through Irish waters each year. The rocky cliffs of the western islands, while dominated by seabirds in summer, extend the habitats of other significant species, among them the chough, the aerobatic and flamboyant, red-billed crow of the Atlantic seaboard. Well-grazed coastal grassland, easily probed for insects and grubs, is its main feeding-ground, but the offshore islands offer caves and crevices for nesting. Although Ireland has known commercial whaling (notably by Norwegians based in north-west Mayo in the early 20th century), it has taken the new interest in whale-watching and cetacean conservation to discover the true richness of Irish waters. Intensive watching has been promoted by the Irish Whale and Dolphin Group since 1991 and has so far recorded 24 species. While the small minke whale is most commonly seen from headlands and islands in summer, there have been remarkable sightings of fin and humpback whales off the south and south-west coasts. Their seasonal occurrence - especially of fin whales in winter - is shedding new light on the patterns of north-south migration among these big whales. In the Shannon Estuary, the resident bottlenosed dolphins, numbering some 80 animals in summer, are the subject both of scientific study and well-regulated tourist boat-trips. Photograph of a Grey Seal close up on the beach in Wexford harbour. On remoter coasts and round the offshore islands, big grey seals fish beneath the cliffs and lift their heads from the water to inspect any humans they see. Where islands are uninhabited, the seals may come ashore in autumn to give birth and suckle their pups. Ireland is at the south-western edge of the species' distribution in the north-east Atlantic, and the really big breeding colonies are at the huge 'seal cities' off western Scotland and along undisturbed coasts in Wales. 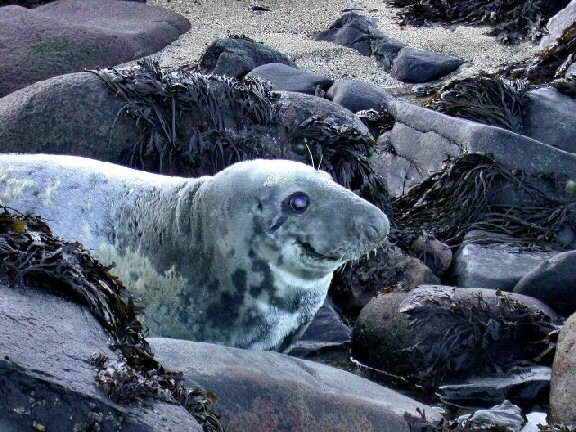 While many Scottish seals visit Ireland's west coast to fish, the native animals breed in relatively small numbers, producing about 150 pups a year at each of the main breeding colonies on the Inishkea Islands off Mayo, the Blaskets off Kerry and the Saltees off Wexford. Studies of their diet have found them to be opportunistic hunters, their prey depending on the type of seabed and time of year, but they are mostly satisfied by smaller, non-commercial species. Ireland's common or harbour seal is the smaller, round-headed animal of estuaries and sand-bars. It is only common at a few locations, and the largest concentration is at Strangford Lough, County Down, where the seals have numbered up to 1,000. This image depicts the fluke of a diving humpback whale (Megaptera novaeangliae) in dark grey sea. The fluke is dark grey/black colour, with a white edge. The distinctive scars on the fluke can be used to aide in the identification of an individual whale. The technique, known as photo-identification has been used by the IWDG to positively ID a humpback whale which has returned to the same area of West Cork at the same time of year, three years running. The tip of the fluke is covered with barnacles. 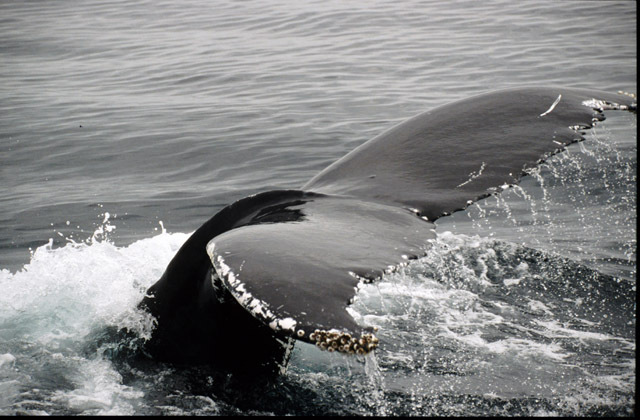 Adult humpbacks can range in length from 11-16m. Scientists believe that humpbacks use the deep waters of the Rockall trench as a migration corridor, but individuals have been spotted in Irish waters of the south and west coasts. In addition humpbacks have been observed inshore in the Autumn/winter period in recent years along the south coast. Due to over exploitation of this species humpbacks are considered an endangered species in the Atlantic. A single calf is born very 2-3 years. 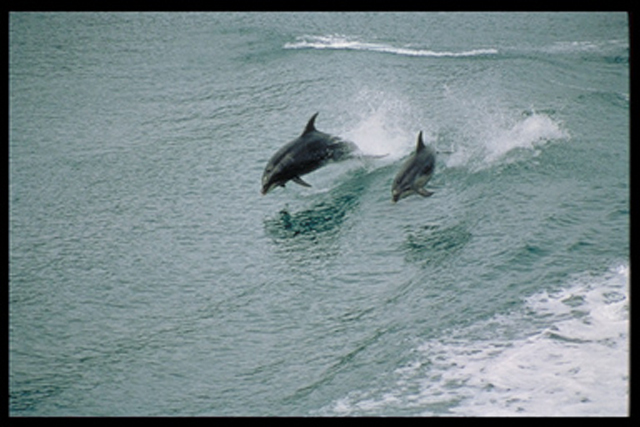 This image shows two bottlenosed dolphins (Tursiops truncatus). Bottlenosed dolphins have a medium grey colour on their backs, with a pale or lighter grey flank and belly. They have a tall dorsal fin add mid-way along their back which is broad at its base and is sickle shaped. The head of a bottlenose is rounded and its beak is short, with the lower jaw protruding beyond the upper, the mouth curves up at the back to give the appearance of a smile. They surface 2-3 times per minute seldom showing beak or fluke. Bottlenosed dolphins are opportunistic feeders, feeding on squid, crustaceans and fish. The Shannon estuary plays host to one of only 4 resident bottlenose dolphin populations in Europe, and has been declared a Special Area of Conservation under the EU Habitats Directive (Wildlife Act Ammend 2000).